Under Natalie Bennett’s leadership, which lasted from 2012 to 2016, the Green Party received their highest ever number of votes: over 1.1 million in the 2015 general election. 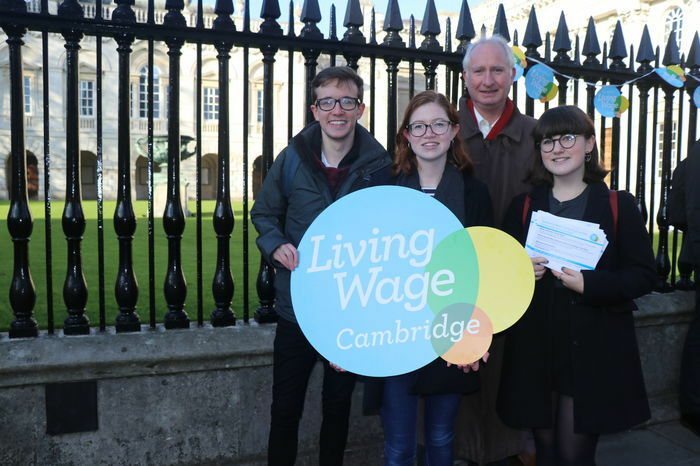 She spoke in Cambridge last month on universal basic income, or UBI, a nationwide system that would see everyone, regardless of income, regularly receive a set amount of money, and which would replace the current benefits system. Critics say that the programme would be far too expensive to be practicable, but Bennett argues that Britain cannot afford its current benefits system as it is. “People are increasingly left with no money in our society, or at risk of that situation. This is primarily due to benefit sanctions, zero hours contracts and generally insecure employment. People need security, and that is what universal basic income offers.” Bennett’s position is not solely about freedom from want, however. She argues that it is also a feminist statement. It would lead to a cultural shift in valuing the casual unpaid domestic work overwhelmingly undertaken by women. Supporters of universal basic income make up an unlikely cohort. Elon Musk, Richard Branson and Mark Zuckerberg have all lauded its benefits. Yet the distinction between these kinds of backers and the Greens, Bennett reminds me, is a significant one. If universal income is set too low, it becomes a subsidy for wages, a way for corporations and employers to squeeze out profits. In their 2015 general election manifesto, the Green Party placed it at £80 a week, which, when including subsidies for children and a retained disability benefit, would come to a gross cost of £331 billion. Although it has been trialled around the world, the criticism that it is far too expensive has been a difficult one for its proponents to shake off. Bennett argues that it is a feasible policy, and could be funded both through the savings made to existing benefit administration – UBI requires significantly less bureaucratic organisation than existing benefits – and through taxation of both individuals earning over £44,000 and transnational corporations. Universal basic income has been Green Party policy for 40 years under the name ‘citizen’s income’. This has been revised in the age of UKIP, where ‘citizen’ has become a politically sensitive and contested term. Universal basic income was rejected in Germany in 2013 in a report which cited, amongst other things, that it would be too big a pull factor in terms of immigration. If it were to happen in Britain, Bennett says, “the rules would be as the rules are now with benefits. You can’t just walk off the plane and claim your UBI, you would have to be a settled, accepted member of society”. Her argument is constructed around the notion of security, a word she wants to “reclaim from the right”. Security is not just applicable to universal basic income, but is also a frame Bennett uses for attempting to convince right-wingers of the importance of things like international aid, climate change, and opposition to Brexit. Whilst she recognises that “there is a moral case why Britain as a rich country needs to help poor countries who we have often exploited and damaged in the past, the moral argument often does not wash with the right wing”. The “self-interest” argument around the notion of security, has far more political leverage. Turning to the EU, Bennett pledges that the Greens will campaign hard in the run up to any potential ratification referendum. The Greens are ardently pro-European, not least because some of their most prominent politicians have had long careers in its parliament. The Greens also support the strong environmental legislation that pooled sovereignty affords, the principle of freedom of movement and EU taxation of multinational corporations. Bennett calls these companies “parasites”, and argues that “if we’re going to change this situation, the people of Europe getting together have a much better chance than the people of Britain on their own”. Bennett argues that to win such a ratification referendum, it will be necessary to open dialogue with those who voted Leave in 2016. “I think we would need to acknowledge that they were absolutely right last time to want to ‘take back control’, that we have a huge democratic deficit in Britain, we have a huge problem with poverty, inequality, desperation. But they’re not caused by Brussels, they’re caused by Westminster”. The Greens would point fingers at domestic elites and policies. “We have an inadequate minimum wage, inadequately enforced. We have crowded schools and hospitals, NHS underfunding, privatisation. For schools I can just say ‘Michael Gove’ and that covers it pretty well, and for decades we have relied on the private sector and the market to provide housing, and it has simply failed to do so. “If you look at the years since the financial crash, profits of big house builders have gone up, as they build fewer and fewer houses. Their role in our shareholder capitalism model is to make money, not houses, which has caused such a huge problem.” The Green Party squarely blames Westminster. Bennett goes so far as to say that one of the Remain campaign’s biggest failures was to have politicians in the spotlight. She calls instead for a “people’s referendum campaign” which will put “ordinary people, including young people” at the forefront. The EU is one of the significant policy divisions that hold the Greens and Corbyn’s Labour party apart. Owen Jones recently called for the Greens to formally join with the Labour party – when asked about such proposals, Bennett dismissed them as “statements coming from someone who I expect will be seeking selection in a safe Labour seat soon”. She has also rejected the idea that Corbyn posed an existential threat to the Green Party, arguing that not only do the two parties differ profoundly on Brexit, but also on domestic policy such as nuclear weapons, Hinkley C, HS2 and infrastructure development. Bennett is critical of the party in other ways, pointing out that “in Labour’s 2017 manifesto, they kept two thirds of the Tory benefit cuts, which received remarkably little attention”. Labour has not yet fully renounced a “strivers versus scroungers rhetoric”, she says, meaning that Labour and the Greens remain “fundamentally different political animals”. Bennett’s prominent ‘Make Votes Matter’ on her lapel is evidence of the most substantial difference between the parties, that of electoral reform. She assures me that the Greens are determined to “finally make Britain a democracy” through a system of proportional representation, which would facilitate six to eight significant parties. This would be a “huge realignment”: Labour would fragment, with Corbynites joining the Green Party position, and the other Labour MPs ending up as “some centre-right form of social democratic party”. However, there is still a great distance to go before such a situation could even be imagined in Westminster.